While coming from at times from places that differ in ideology, the question and the statement are rooted in the shared belief of cooperative excellence, in developing a team whose sum is greater than its parts and loving in a way for others that is greater than oneself. Two brothas from separate mothas embodying these ideals are Ryan Wilson and TK Petersen. Ryan and TK both call Atlanta home, with Ryan having deep roots in the city and TK proudly representing the Virgin Islands. Fate, as it were, never arrives at a moment of our choosing, and their brotherhood formed as friends and roommates at Georgetown University in Washington DC. Their first encounter developed into a friendship would lead to things much greater. Upon graduating from Georgetown they sought to cultivate a space for the young Black entrepreneur, educator, disruptor, business person and overall world-changer — to find a space for them to gather and create community. Young professionals didn't find country clubs a good fit, and coffee shops and restaurants don't afford the space needed to do creative work. So the TK and Ryan came up with their own plan to create a space for members that offered everything they needed. In a time in which we feel more electronically connected and less physically connected, these two leaned on their collective gifts and talents to create a change. 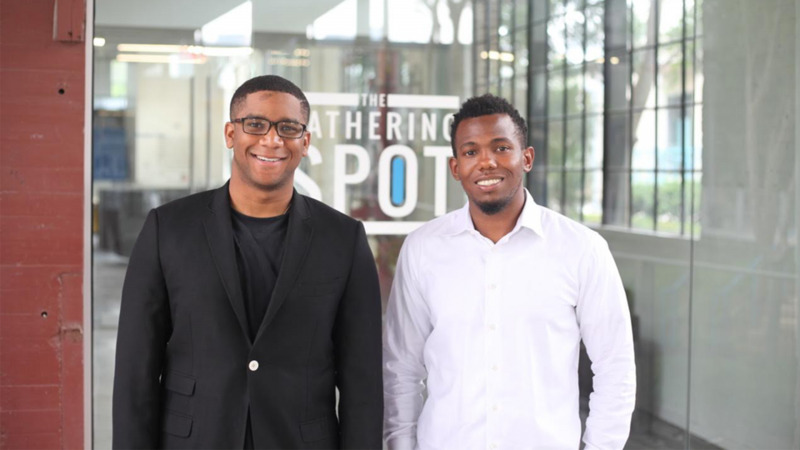 In 2016, Ryan and TK opened The Gathering Spot in Atlanta, an innovative, private, members-only city club that brings together a motivated and diverse community of professionals, creatives and entrepreneurs. Members benefit from a 24/7 alternative work and social environment, complete with stimulating events, concierge services, integrated technology and a full-service restaurant and bar. The Gathering Spot has become so successful that Wilson and Petersen have begun expansion in both Washington D.C. and Los Angeles. Yet their notion of “success” can’t be found in their dollars and cents. To be in the company of these gentlemen, both under 30 years of age, you realize their success can be found in their commitment to living their values — the commitment to collective impact, the commitment to holding true to one's principles, and a commitment to truly blazing a trail in spaces that have only been seen in your heart and in your mind and making that a reality for others. Like many, their impact in other ways goes unseen. Whether through quiet donations to local charities, hosting events for local students and veterans, or donating food to causes close to their heart, they have manifested what it truly means to be servant leaders. What they have created is what my good friend Anthony Rose would call a retro revolution, bridging the social-media age with the age of community-building and celebration of Black excellence. Ryan and TK embody innovation, cultivation and inspiration. They have walked into the golden rooms and yet not lost the common touch. They have answered the question, “Am I my brother's keeper?” with a resounding “Yes, I am!” And then they have walked out and demonstrated what that belief looks like. Ryan and TK have co-created a space conceptually and physically for us all to be able to gather our brilliance and our community, and that is why Ryan and TK are Black History, today!